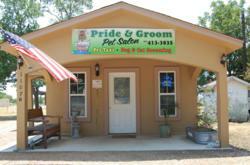 Pride and Groom Pet Salon is making changes under new ownership. The salon specializes in pet grooming Austin residents seek, including dog grooming in Austin, cat grooming and pet boarding in Austin. The salon is still located in Manchaca (South Austin) but has moved from Croydon Loop to a cozy building on FM 1626 near Manchaca Road. After acquiring the salon, Vicki welcomed a number of Austin dog groomers with a loyal client base including Cat Tucker and Lisa Novak. She believes the new groomers will bring reputable attention to the salon, as well as new clientele and a need for expansion. Pride and Groom offers cat grooming, a service many groomers are now refusing. Vicki said, “Bathing and grooming a cat can be tricky, but we’re up to the challenge.” In addition to luxury grooming and boarding services, Pride and Groom also offers pet sitting in Austin, Manchaca, and Buda and a pick up/drop off pet taxi for nearby residents. For more information about Pride and Groom Pet Salon and the services they offer, visit http://www.prideandgroompetsalon.com/index.html. They are located at 1107 FM 1626, Ste. B in Manchaca, TX. Hours are Monday from 8am-4:30pm, Tuesday through Friday from 7:30am-5:30pm, and Saturday from 8am-4:30pm. Walk-ins welcome, appointments preferred. Pride and Groom Pet Salon is a locally-owned family business that specializes in luxury dog and cat grooming in addition to pet boarding in the Austin area. Pride and Groom cares for your pets like they are part of the family. You can rest assured that after visiting, your pets will be healthy, happy and clean.